Some eyebrows were raised yesterday when Gov. Tim Pawlenty selected an artist in Georgia (Georgia has 15 electoral votes. Minnesota has 10. Make of that what you will) to paint his official portrait to hang in the hallway of the Capitol. Isn’t there a Minnesotan who knows how to paint a decent portrait? On Twitter today, I asked people with the ability to sketch to provide their version of an official portrait of the governor. Normally, I don’t get a lot of response to these sorts of things. I think News Cut caters to the stick figure drawers in all of us. But Judy Grundstrom sent along her idea, which is a version of the cover art of the governor’s soon-to-be-released book. Want to take a crack at this? Use this form to make your submission or just e-mail it to me at bcollins@mpr.org. Gov. 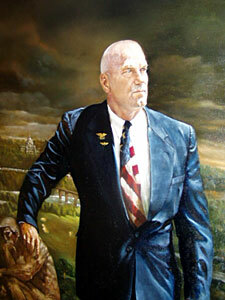 Jesse Ventura toned it down a bit, but still departed from the usual gubernatorial portraits. On her blog, State of the Arts, MPR’s Marianne Combs points out that Ventura, too, went beyond the great state of Minnesota to find an artist. Now, as Marianne indicated yesterday, Pawlenty’s artist — Ross R. Rossin — has some experience in this field. The challenge for him may be whether he can make Tim Pawlenty look as much like Bill Maher as he made President George W. Bush look. Bill Maher? Try Victor Garber! Maybe Pawlenty is sending a message to the legislature. The taxes are just too high on Minnesota artists. Who’s paying for this portrait? If the governor really cared about fiscal responsibility then he would put off the portrait until the state is in better financial shape. Or does fiscal responsibility only come into play when cutting programs for poor and disabled people? Even if the state is NOT paying for it, I can think of many better ways to use the money than glorifying one person. I miss Eli Stone too.